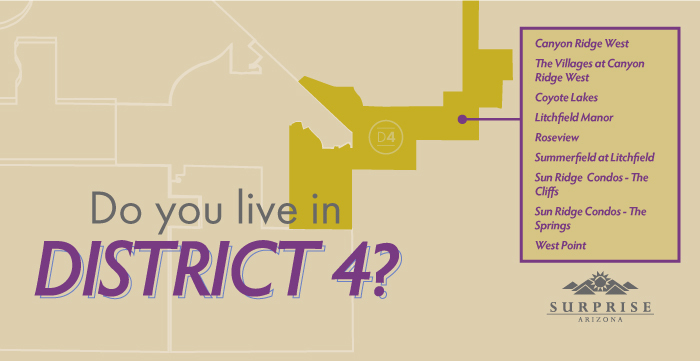 Welcome to the Surprise District 4 website! This is a place where you can find updates on what’s happening in the district and what your council is working on city-wide. 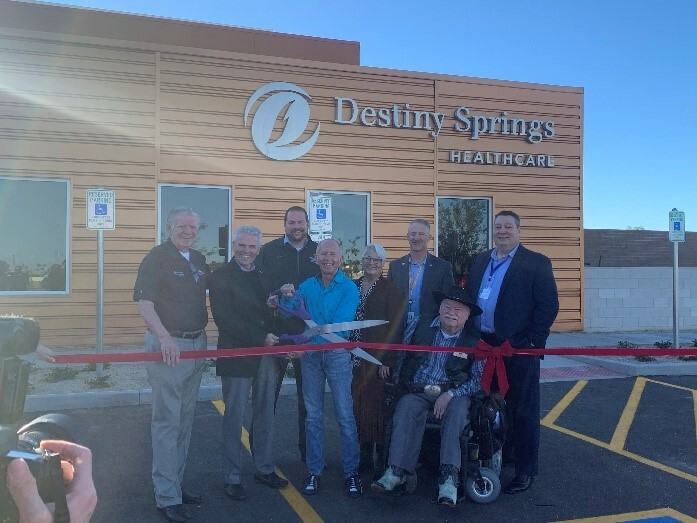 D4 includes the following neighborhoods: Coyote Lakes, Original Town Site, Roseview, Canyon Ridge West, The Villages at Canyon Ridge West, Litchfield Manor, Summerfield at Litchfield, Sun Ridge Condos – The Cliffs and Sun Ridge Condos – The Springs, West Point. 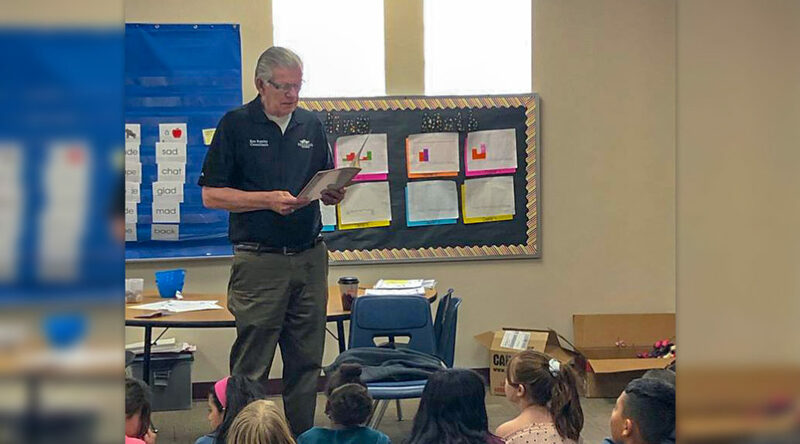 Join Vice Mayor Remley at the Surprise Community Center, 15832 N Hollyhock Street, at 6:00 p.m., on the 4th Wednesday of each month. Get your questions answered, share ideas and learn more about your city! My District 4 Home Beautification Award program is aimed at recognizing residents who show pride in their home through renovation and maintenance activities. One winner is announced each month at my monthly community meeting and receives a framed professional photo of their home, a certificate of appreciation and gift certificates. 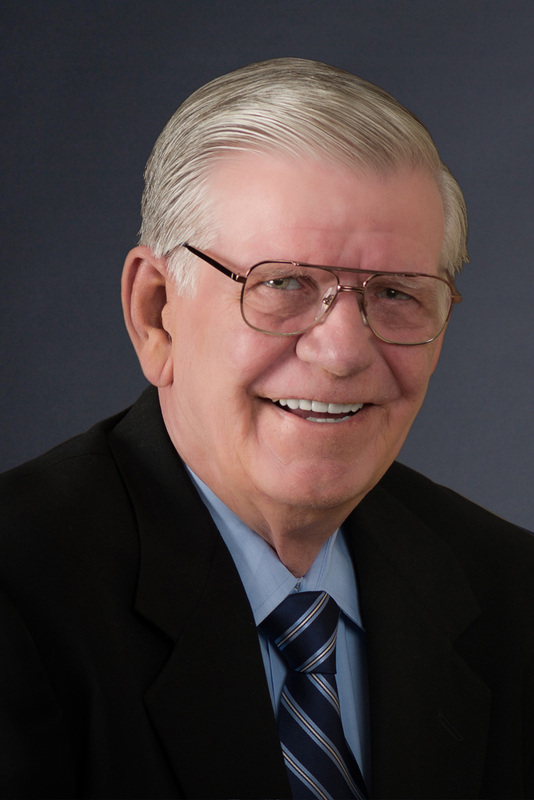 You can nominate a neighbor for the award by contacting Council Assistant Jodi Tas at jodi.tas@surpriseaz.gov or 623.222.1330. Event date: May 8, 2019 Event Time: 06:00 PM - 11:59 PMLocation: 15150 W. Mondell Rd.Surprise, AZ 85374Description:The applicant is requesting approval of a Conditional Use Permit (case FS19-281) to allow for a new addition to an existing mini-storage facility located on the northeast corner of Bullard Avenue and Bell Road. Event date: May 8, 2019 Event Time: 06:00 PM - 08:00 PMLocation: 16000 N Civic Center PlazaSurprise, AZ 85374Description:This active solution-driven Commission focuses on community-wide advocacy to address the needs of people with disabilities while increasing public awareness. Public attendance is encouraged.All meetings are carried on Surprise TV and streamed online. Replays will include closed-captioning.